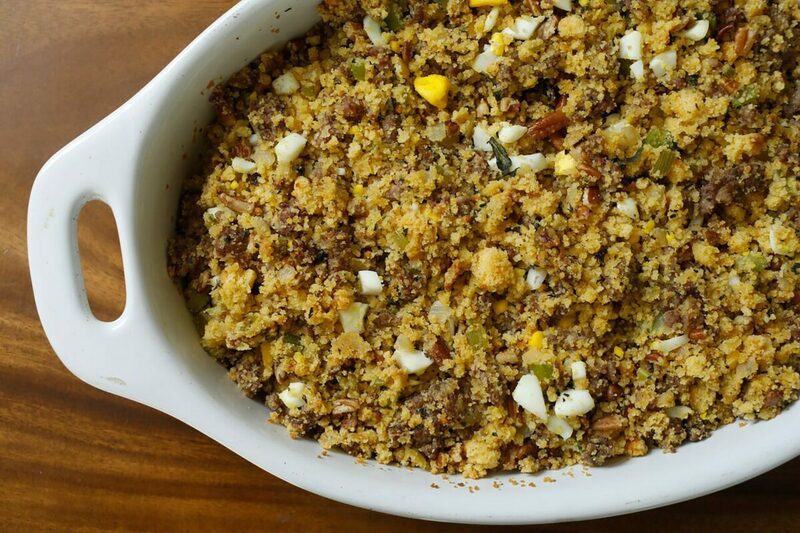 Sweet and savory, this gluten free cornbread dressing features sausage, hard-boiled eggs, and crunchy pecans. It’s a tasty, fluffy GF iteration of the traditional dressing from the family of our friend Tara Brooke (featured in our Fall 2017 issue of GFF Magazine) and a perfect addition to any holiday table. Note: This recipe calls for GF cornbread made from a mix and left out the night before to dry out, as well as hard-boiled eggs, so plan accordingly. The night before serving, crumble the prepared cornbread and leave out, uncovered, overnight. In a large saute pan over medium heat, cook the sausage, occasionally stirring and breaking it up, until fully cooked, 10 to 15 minutes. Transfer the sausage to a bowl to cool, leaving the sausage grease in the pan. Preheat the oven to 375°F. Return the pan to medium heat, add the 2 tablespoons olive oil, celery, onions, and 1/2 teaspoon salt, and cook, stirring occasionally, until translucent but not browned, about 20 minutes. Add the mixture to the sausage, add the basil, thyme, and oregano, and stir to combine. In a large bowl, combine the crumbled cornbread, hard-boiled eggs, pecans, and sausage mixture. Stir to combine, then mix in the beef broth. Grease a 9 by 13-inch casserole dish with olive oil. Transfer the dressing to the pan, leaving it fluffy (do not compress). Cover the pan with aluminum foil and bake for 20 minutes. Remove the foil and cook 10 minutes longer. Serve.